Objective: To describe the use of conservative treatment of a proximal long head of the biceps (LHB) tendon rupture for a patient preferring to forego surgery. Background: The patient was a 49 year old male who presented with pain and weakness in the left shoulder, and a bulge in anterior, left brachium. The patient reports hearing and feeling a “pop” after trying to catch a falling 10-15 pound box, followed by pain and the presence of the bulge in his arm. The physician recommended physical therapy for strengthening and pain reduction as the patient elected to treat conservatively over a surgical repair. Methods and Measures: The patient participated in nine sessions of physical therapy over threeweeks with interventions including therapeutic exercise, therapeutic activity, manual therapy, a home exercise program, and modalities as described in the report. Outcome: Following physical therapy, the patient met all strength and functional goals and was discharged from therapy to return to work without restrictions. Conclusion: Conservative treatment for LHB rupture can be a viable option for patients who may have a sedentary or non-physically demanding lifestyle and who adhere to the home exercise plan. The purpose of this case study is to provide our methods used in the conservative treatment of a patient who elected to forego surgery following a diagnosis of an avulsed LHB with distal retraction. The patient is a 49 year old sales specialist who works in a retail warehouse that requires administrative work and some minor lifting. He was referred to physical therapy after a physician’s diagnosis of an avulsed LHB with distal retraction suffered in an incident 34 days prior to the initial visit to physical therapy. The patient reported seeking no medical attention since the time of the injury. MRI results support the diagnosis, revealing an avulsed LHB tendon with distal retraction by 8.5-9cm distal to the humeral head apex into the upper arm with surrounding peritendinous fluid and biceps long head myotendinous junction edema. The patient reported the mechanism of injury was sustained from moving a box of approximately 10-15lbs.,and when it started to fall from a shelf he instinctively reached with his left arm to catch it. The rapid elbow extension that followed from the weight of the box produced a popping sensation that was audible to the patient, followed by the appearance of a muscle bulge in the distal left brachium. The patient reported an initial pain rating of 9/10, with a pain rating at the initial evaluation of 2/10 at rest and 8-9/10 when symptomatic. 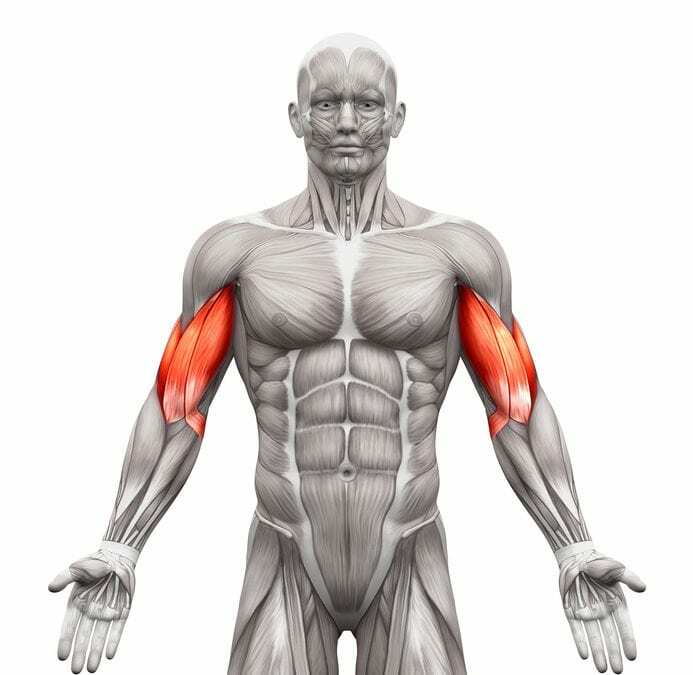 The pain located in the anterolateral deltoid region was described by the patient as intermittent and achy, present when pushing heavy objects, performing forearm supination, turning the steering wheel while driving, and waking him if he slept on his left arm. He reported ice and rest were used to relieve the pain. There was no report of previous impairments or deficits in the left shoulder, steroid use, or any other possible mechanism of injury. However, it may be important to note the patient’s medical history included a full rotator cuff tear in the right shoulder two years prior. The tear was surgically repaired, but the patient reported he has not regained full function or strength in the right shoulder. The patient will continue to work throughout the course of therapy on work restrictions that include no lifting over 10lbs. In most cases, proximal biceps tendon ruptures present with acute pain, swelling, and bruising in the upper arm or shoulder, sometimes accompanied by a Popeye sign from the retracted, distal muscle belly. Other common presentations include an estimated 30% acute strength loss in elbow flexion, mild supination strength loss, and fatigue cramping.3 Many of these symptoms were evident in this case. During the initial evaluation, shoulder and elbow ranges of motion (ROM) were tested using a goniometer. All bilateral shoulder and elbow, active and passive ROM were measured to be within normal limits. Muscle strength was tested manually by the physical therapist on a scale of 0-5. Grip strength was assessed using a handheld dynamometer, grip position II, recording the average of three trials. Initial bilateral shoulder, elbow and grip strength results can be seen in Tables 1 and 2, below. Any manual muscle tests (MMT) not included in the tables are considered to be within normal limits. The assessment of the patient’s posture presented with slight forward head and mild anteriorly rounded shoulders. Upon palpation, the left bicipital groove and left lateral deltoid presented with mild tenderness, and the LHB muscle belly presented as a visible bulge during elbow flexion. All subacromial impingement tests were negative including Painful Arc and Hawkins-Kennedy. Grip Strength 116 lbs. 110 lbs. The plan of care was prescribed for the patient to be seen by the physical therapist three times a week for three weeks. The patient was guided through their individual therapeutic exercise plan by the physical therapist. These exercises were instructed to be performed in a pain-free manner and ROM. The time of the therapeutic exercises included preparation for each activity, patient education and training of each exercise, performance of the exercise, post-assessment of patient’s performance, and patient education of the importance of adherence to the home exercise program. All interventions performed can be reviewed in Table 3, below. *Interventions added to home exercise program were performed 1-2 times a day. **Goals assessment performed on day 4. See results in Table 4. The patient’s progress was assessed regularly throughout the nine visits, with goals assessments during the fourth and ninth therapy sessions. During each session, the patient reported regular improvement in functional ability during daily tasks and gradual decreases in pain symptoms. Following the ninth and final treatment session, the patient was discharged from physical therapy and allowed to return to work without restrictions. All of the goal assessment results can be seen in Table 4. The patient was educated on the importance of continuing the home exercise program as tolerated to maintain the results. Floor to waist lift Unable to test 75 lbs. Upper body ergometer Unable to test 10 min. All manual muscle test goals were 100% achieved after nine visits. The ability to perform job duties, functional goals for lifting, and upper body endurance were unable to be tested during the fourth session due to patient’s time constraints, but each was 100% achieved during the final goals assessment. The goal for decreased subjective pain was set initially for 4/10 at its worst. During the final assessment, the patient reported the pain to be 5/10 at its worst, but occurrence of the symptoms had decreased by 90%. The literature has shown LHB tendon ruptures occur more frequently in men than women, often in the range of 40-60 years of age. The use of anabolic steroids may also increase the risk of a biceps tendon rupture.4 Our patient in this study, being a 49 year old male, fit two of these three criteria for increased risk of this injury. Due to his history of the rotator cuff surgery in the opposite arm, he elected to treat the LHB rupture with conservative physical therapy in order to return to full work duties. It is important for physicians, surgeons, and therapists to know the possibility of recovery from this injury using a conservative versus surgical approach. In any case, medical providers should appreciate which patients are the best suited for either approach as well as the benefits of each approach. Our patient was an excellent candidate for conservative therapy considering his age, healthy lifestyle, and his job duties requiring a low physical demand. I would like to thank Melissa Cook, DPT, for her completion of the initial evaluation; Brianne Ernst, DPT, COMT, for her guidance and careful review of this manuscript; and Sara Bayerle, SPT, for her assistance in providing therapy services. Miller, K. E., & Solomon, D. J. (2008). Paralabral rupture of the proximal biceps tendon from light weightlifting. Military Medicine, 173(12), 1238-1240. Smith, D. (2017). Proximal versus distal biceps tendon ruptures: When to refer. British Columbia Medical Journal, 59(2), 85. Pugach, S., & Pugach, I. Z. (2013). When is a conservative approach best for proximal biceps tendon rupture?. Journal of Family Practice, 62(3), 134-136.